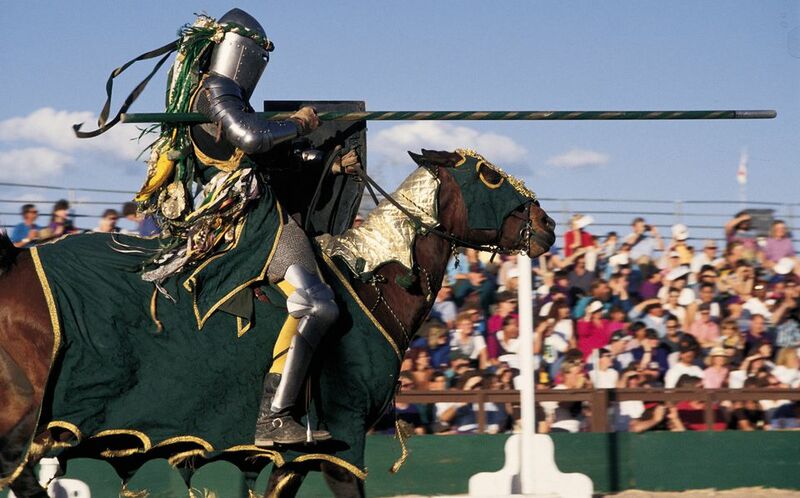 Every year, a part of Apache Junction, Arizona is transformed into a 16th-Century European Country Faire when the Arizona Renaissance Festival opens to the public during the months of February and March. The Arizona Renaissance Festival is a wonderful combination of amusement park, shows, comedy, music, feats of daring street performers, shopping, and indulging. The Festival is spread out over 30 acres, and it is easy to spend an entire day there. For more information, visit the Arizona Renaissance Festival online or call for information 520-463-2700. Arizona Renaissance Festival will be open every Saturday and Sunday from February 9 through March 31, 2019. It will also be open on President's Day, Monday, February 18. Hours are from 10 a.m. to 6 p.m. The Renaissance Festival is open rain or shine. Student Days are Tuesday, March 5 (elementary schools) and Thursday, March 7 (junior and senior high schools) from 9 a.m. to 2:30 p.m. These days are set aside especially for educators to highlight the historical aspects of the Arizona Renaissance Festival. The Arizona Renaissance Festival is located seven miles east of Apache Junction on US Highway 60. That's in the southeastern section of the Greater Phoenix area. You will see signs directing you to the Festival as you approach the Gold Canyon area. For some people, this location may be far to drive; you won't find any public transportation to this attraction. Here is a chart with some approximate driving times and distances to Apache Junction. Parking is free. Tickets purchased at the gate are $26 for adults, $23 for seniors (60+) and military, $16 for children 5-12, $13 for child dependents of active and/or retired adult military personnel and/or their spouses. Children must provide dependent military ID. Children under 5 are free. Purchase tickets in advance online and save $1 on adult and child tickets. The admission price includes parking and all entertainment shows, including the Tournament Jousting and Birds of Prey show. It does not include the purchase arts and craft items, food or beverages, or rides and games. You can also buy a season pass that's valid for any festival day except student days: $155 for an adult pass, $70 for a child pass (ages 5-12), $180 adult pass with VIP parking. Some restrictions apply. You may be able to find discount tickets at Fry's Stores, Fry's Marketplace, Wendy's, Hall of Frames, Cobblestone Auto Spa, and Phoenix Flower Shops. If you have a coupon, bring it to the box office (you can't buy tickets online with a coupon). The closest community is in Apache Junction. It is called Gold Canyon. The Gold Canyon Golf Resort and the Best Western are the recommended hotels. Read reviews and check availability at TripAdvisor. When you first arrive at the Arizona Renaissance Festival it is best to pick up a Schedule of Events, and make a few plans. There may be some scheduled shows that are most important to you, like the Jousting Tournament, and you'll want to plan your day around those events. All day long, there are shows going on at the many stages of entertainment at the Arizona Renaissance Festival. Most shows are between 30 and 45 minutes in length, but you are free to come and go as you please. The focus for the stage shows at the Arizona Renaissance Festival is music, merriment, and mirth. Most of the shows are suitable for all ages. There are a few shows, however, that are noted in the schedule with a bold "LC" next to them. That denotes "Loose Cannon." That means that you can pretty much expect raunchy and lewd content, so if you don't appreciate that kind of humor, or you don't want to subject your kids to it, wander elsewhere. Zilch, the Torysteller: Our first loose cannon. He "stells" the "tories" and you "letter" "bisten" carefully. He's pretty fast, and the comedy can be very subtle (even many adults don't get the jokes), so most children won't understand anyway. Ded Bob: Another loose cannon who isn't quite a subtle as Zilch, and Ded Bob's humor will most certainly involve body parts. Street Performers: Elaborately costumed performers and artisans roam the town's streets portraying historical and fanciful characters, interacting with all the visitors. King Henry and his Royal Court, duelists and Ladies, musicians and even the Knights' chargers wear authentic garb from the Renaissance era. Jousting: A day at the Renaissance Festival would not be complete without a visit to the King's Tournament Area to see the brave knights joust for royal recognition. Jousting is held three times daily in the King's Tournament Arena. Music and Stories: The Jamila Lotus Bellydance Carnivale performs right near the jousting arena. Melangell sings ancient songs and tells stories of Ireland, Scotland, Wales, and England. Sarah Mullen will entertain you by playing her harp, NeidFyre will serenade you with the fiddle, and the high energy band Tartanic will entertain with an edgy Celtic performance. Games and Rides: There are contests and rides for people of all ages, most requiring additional fees. Prices are clearly posted, and cash is accepted, so there's no standing on additional lines for tickets. Some rides for the little ones are free. There are a few animal rides, and a petting zoo. Test your skill at axe-throwing or launch a tomato at an insulting peasant at Vegetable Justice. If you're with a friend that you'd like to embarrass, you can certainly get the job done at the Village Pillory: torture at a reasonable price. Demonstrations: A variety of craftsmen, artisans, and food purveyors are on hand at the Arizona Renaissance Festival to add to your merriment. There are demonstrations of weaving, armor-making, and other activities that were typical of the period. More than 200 vendors will be there to display and sell their wares. This is a great place to get unusual gifts, like goblets or swords. When you are ready to eat like the King himself, you'll find fare suited for royalty at the Arizona Renaissance Festival. The King's giant Roasted Turkey Leg is always a popular choice. Many foods can be eaten with one hand so you can take pictures with the other hand, like sausage on a stick, and the chocolate-covered banana on a stick. The Pleasure Feast is a 1-1/2 hour meal and show, where you'll be pampered with a five-course meal, lively (and often raunchy) entertainment, and go home with a souvenir of the event. Every day of the Festival there are two Pleasure Feasts, one at noon and one at 2:30 p.m. Tickets are additional and while beer and wine are included, bring cash for tips. Children are not typically in attendance. Reservations are strongly recommended as seating is limited. The seats are assigned, have no arms or backs, and sometimes you'll have to straddle a table leg. Space is tight. Let them know in advance any dietary needs. Wear comfortable shoes. You'll be wandering around about 30 acres of non-paved grounds. Don't try to do and see everything in one day. You can't do it, and you'll just get frustrated. Pick out a few events or shows that are important to you, plan around them, and take the rest of the day as it comes. Strollers and wheelchairs are available to rent, on a first-come, first-served basis. You may come dressed in costume. Many people do. Costumes are also available for rental. Costume swords and daggers are permitted as long as they are properly sheathed. Bring cash for food, games, and rides. Cash tips are appropriate at the Pleasure Feast. Tips are also appreciated by many of the performers. There are ATMs at the Festival. Leave shopping until the end of your day, so you don't have to carry around your goodies. If you want to deposit your treasures in your car and come back, they will stamp your hand at the main entrance. You can enter or leave shows at any time, even when they are in progress. No one minds, aside from Ded Bob. Over the years, the Arizona Renaissance Festival has grown significantly. The few stages, with seats of bales of hay, have been replaced by many stages, with benches. There are still a few bales left. Remember that an outdoor venue like this can get pretty hot on a sunny day. There are various areas of shade on the grounds, and the stages all have shade cover, but don't forget to wear a hat, sunglasses, and sunscreen. Don't know what a privy is? That's what knights and damsels refer to as a restroom. The Arizona Renaissance Festival has a separate area for those of you who might want to have a unique wedding. Looking for a job at the Arizona Renaissance Festival? Call 520-463-2600. Tempe, AZ Has One of the Top U.S. Art Festivals and 200,000+ Attend!